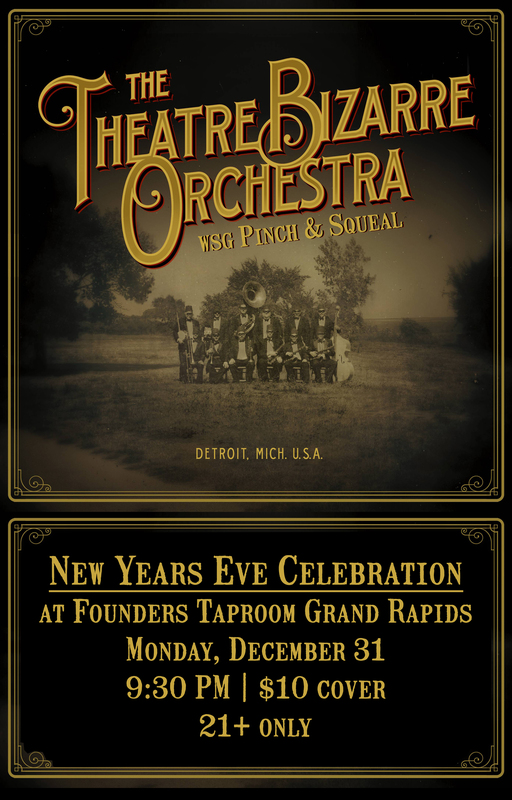 NYE at Founders with Theatre Bizarre Orchestra wsg Pinch & Squeal - Founders Brewing Co.
Join us on New Year’s Eve for the best way to ring in the new year…with The Theatre Bizarre Orchestra with special guest Pinch & Squeal! The genesis for this project occurred when David J. was in attendance at the 2014 Theatre Bizarre Gala event, performing a spontaneous rendition of his band, Bauhaus’ classic, ‘Bela Lugosi’s Dead’ with the award winning nine piece jazz ensemble, the Planet D Nonet. In their unique take on the song, Bela Lugosi meets up with Cab Calloway’s Minnie the Moocher for a delirious sojourn down in Chinatown where they inevitably end up ‘kicking the gong around’. That chance encounter lead to the formation of the Theatre Bizarre Orchestra, the house band for the “greatest masquerade on Earth” known as the Theatre Bizarre. Together David J. & the TBO ignite the ghost lights of vaudevilles past, taking the audience into another dimension where a demon clown is your best friend, your worst nightmare, and your only guide. Hail Zombo! An eclectic vaudeville collection of awesomeness and hilarity! Clichéd sentimentality, kamikaze alcoholism and old-wheeze jokes, these two knock-out songs you wish you didn’t love, tell jokes you wish you couldn’t laugh at, and even worse magic. A modern twist on comedy duos throughout history, they’ve shoved vaudeville kicking and screaming into the 21st century! Pinch and Squeal have opened for Piff the Magic Dragon, Puddles Pity Party, burlesque legends and Transylvanian saxons. Prepare yourself for guaranteed laughter, something in french, and quite possibly a banana puppet.